Capturing the spirit and essence of your best furry friend! 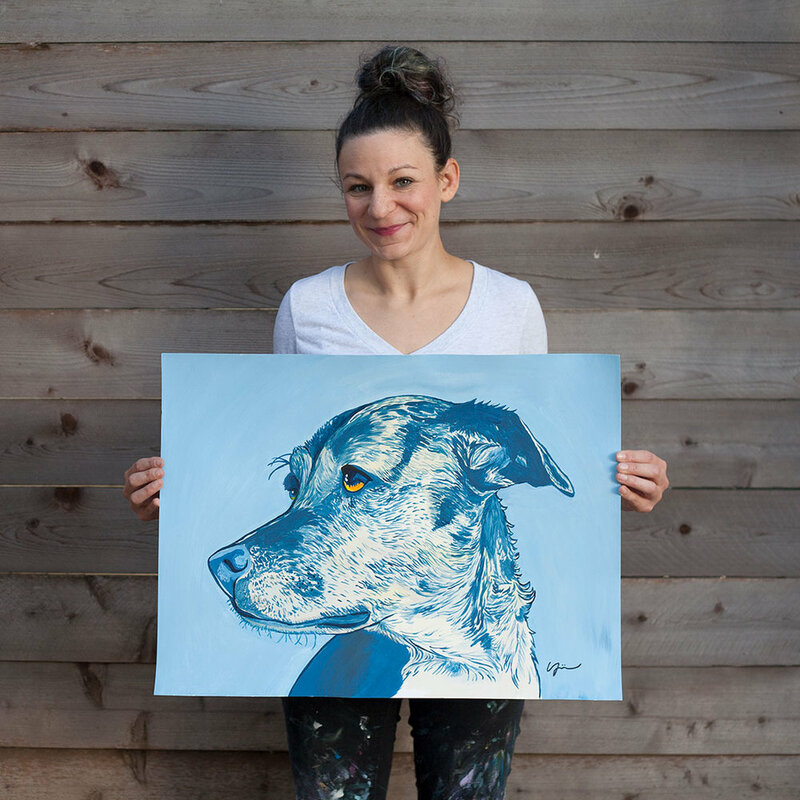 Introducing fluid dog portraits on canvas in various sizes! Hello and welcome! My name is Miabella. Canine behavior specialist and portrait artist, I have always had a passion for all things dog and art. My goal in painting dog portraits is to capture the spirit and essence of your beloved companion through movement and color play. My dog portraits are UV protected and painted with high quality acrylics on 18x24", 140 lb, acid-free, cold pressed watercolor paper, and will ship unframed, rolled in mailing tubes. Each painting is $220. Taxes and shipping/handling are not included, and will be estimated based on your location. Do you want to fancify your majestic creature with a custom painting made by yours truly? After filling out the form in the previous button, I will reach out to you within 1-3 business days to discuss your painting's timeframe and obtain a photograph from you of your dog. This step is muy importanté!!! The content and quality of your photo will determine how well I can capture your dog's personality in the finished painting. If you live in/around Austin, TX, I am a photographer, too, and a photo shoot can be arranged with me! When your photo has been approved, I'll e-mail you an invoice. I work on commissions in the order of payments received, so when I get yours, I will reach out to you about an ETA, and will keep in touch with you along the way. I am so looking forward to painting for you!! If you have any questions, comments or concerns, please feel free to contact me.